Taipei 松山機場Song Shan Airport was originally built by the Japanese in 1936 (松山 is pronounced Matsuyama in Japanese) as a military airbase. After 1946, it was used as an international port of entry until 1979 when the much larger CKS (now Taoyuan) International Airport took over. It has remained underused as a domestic airport. Unfortunately, after the inauguration of Taiwan HSR in 2008, domestic flights could no longer stay competitive; although this was also when cross-strait direct flights gave the airport a new lease on life. It has since been renovated (above), with Terminal 1 receiving international passengers and, starting in 2011, Terminal 2, for domestic flights. Principally because of the high real estate value of the land on which 松山機場 occupies, plus the many flight restrictions required for safety reasons, there have been calls for a relocation. The question is where can the airport move to. If history is of any guide, there may be two possibilities. During the Pacific War, the Japanese had built 71 airports in Taiwan (including the seaplane port in Tamsui); detailed records of 46 remained intact while the rest were long lost. 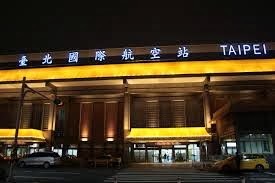 After the Nationalist Gov't takeover of Taiwan in 1945, only two, 松山 and 岡山 airports, were slated to be retained. However, starting in 1947, more were resurrected, repaired, and drafted into services again. Translation: "...Matsuyama Airport was the IJN Taipei Airbase. In addition, among the US targets in Taipei-shu, other than Matsuyama, there was also the Itahashi Airbase, designated Target No 54 and noted as a main target. The US map showed that this airbase was located southwest of Matsuyama, south of the junction of three rivers (most likely Tamsui, Da-Han, and Xindian Rivers), within Banqiao area. According to post-war records, Taipei area did have three airbases, one for the IJN, and two, IJA. Since Matsuyama is known to be a naval airbase, and the unfinished Taipei South Airbase, the army, the one in Banqiao must also had been an army airbase." Therefore, two possible locations for 松山機場 to move to, i.e., 萬華Wanhua and 板橋Banqiao. Part of the land is probably still owned by the state; however, acquiring the rest of the land by eminent domain is certain to encounter great public resistance. In addition, Taiwan HSR also travels through both these districts. All things considered, relocation of 松山機場 to either place or, in fact, anywhere within Taipei City proper may not become a reality at all. Beautiful weather here in Taipei for Chinese New Years! Hi Marc, thanks for the links. They do provide more info. 南機場 indeed was never a functional airport, it became a residential area for the air force families in 1949. I also will need to look into the U of Texas collection to see where Itahashi Airfield was. Here, we are in deep freeze again with two more snow storms coming up.